Free 6 Piece Tool Set Included with purchase! 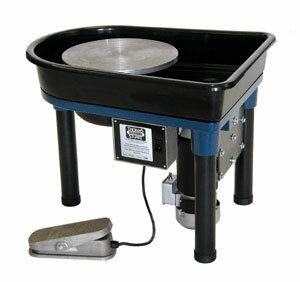 The removable splash pan design can be removed easily by twisting and lifting the wheel head and removing the one-piece splash pan. This design is cleaner and easier to use than the standard two-piece splash pans on other wheels. Skutt warrants this wheel to be free from defects in both materials and workmanship for a period of 5 years from the date of purchase. The popular adjustable leg extensions easily convert any of our wheels into a stand up wheel by utilizing the unique cast aluminum clamp that attaches to the 2" pipe leg. 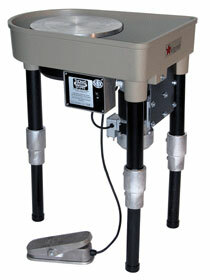 These legs make the wheel infinitely adjustable to a maximum 30" in height. 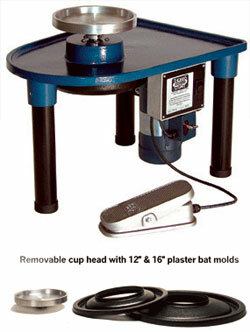 The cup head system can be interchanged with the wheel head for use with plaster bats that simply drop into place. These plaster bats can be made inexpensively with either the 12" or 16" mold. This WILL NOT work with the Thomas Stuart Kickwheel.